My birthday month has officially arrived! April’s birthstone is the diamond, which is probably why it is one of my favorite gemstones. Though deBebians carries an incredible collection of diamond rings, I wanted to share some of our other diamond jewelry that is just as beautiful. The pieces that I have specifically chosen are lovely jewelry pieces that will be welcome in any woman’s fine jewelry collection. They are classic pieces of jewelry that will never go out of style and may also be worn by women of any age. 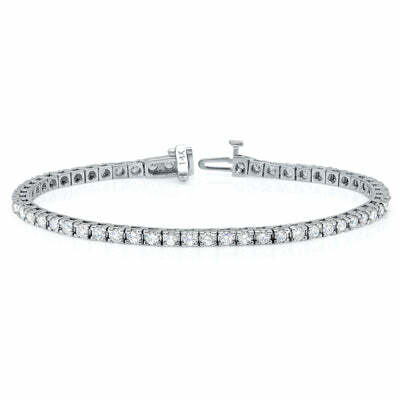 This diamond tennis bracelet may be purchased with a length of 6.5 inches, 7 inches, or 7.5 inches. 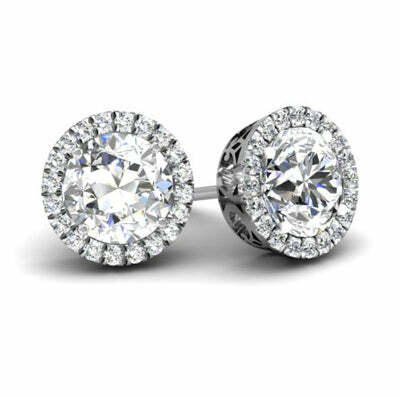 The diamonds are round brilliant cut and are cradled effortlessly by four prong settings. This bracelet may be worn for any number of occasions, including a wedding or another special event. Like diamond studs, halo earrings are timeless jewelry accessories. A halo of diamonds surrounds the center stone, which adds sparkle and brilliance to each earring. This pair of diamond earrings does not come with the center diamonds. Please browse our collection of loose diamonds or enlist the assistance of our GIA graduate gemologists by filling out a personal diamond shopper form. 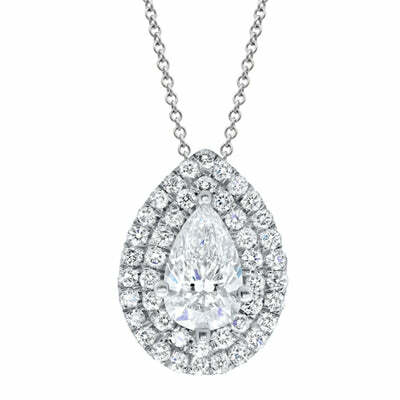 This double halo necklace will enhance a pear-shaped center diamond dramatically. The diamonds have G color and VS clarity, with the total carat weight of the side diamonds being approximately 0.45 cttw. We have even more gorgeous diamond jewelry available at deBebians.com!